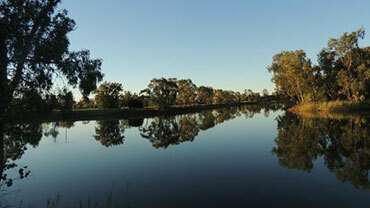 A modern and vibrant place, Goondiwindi still retains the stylish simplicity of a traditional country town and has all the amenities you could want or need. The tree-lined streets, well kept gardens and the Macintyre River, whose beauty is one of our greatest assets, are all worth seeing. 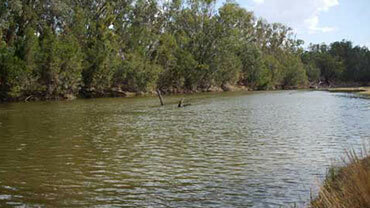 The river frontage provides a unique and tranquil setting for one of Queensland’s fastest growing rural communities. It boasts a wide range of shopping, dining, accommodation and entertainment. More than 14,000 people reside in the town and surrounding region. 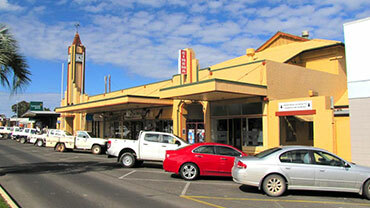 The Goondiwindi Visitor Information Centre is located in the heart of town where the friendly staff are always happy to assist you to discover what there is to see and do in our region. Gunsynd, the famous Goondiwindi Grey, and icon of racing as the only horse to win at every track along the eastern seaboard, remains a legend today. 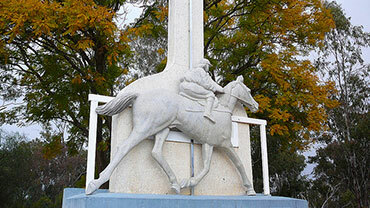 His statue stands in the Apex Park as a tribute to his courageous feats, while across the road, the Gunsynd and Rodeo Memorabilia Tribute displays many of the great horse’s trophies and pictures. Take the time to watch a video of his finest moments. A Border Customs Point before Federation, this authentically restored building and its magnificent cottage garden house a rich and colourful collection of mementos from yesteryear. 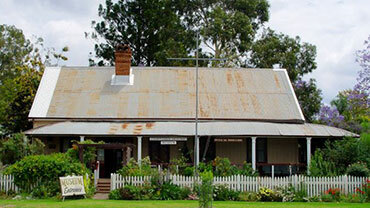 Also in the grounds is Martha’s Cottage, built in 1875. The Museum is open everyday day except Tuesday from 10am – 4pm. 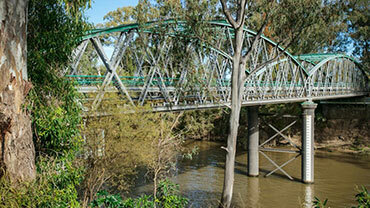 The level 3km walkway along the majestic, tree-lined Macintyre River features a series of interpretive signs about the environmental, social, economic, historical and cultural aspects of the river. 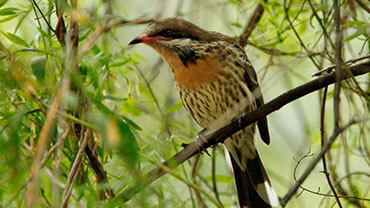 Enjoy the tranquillity and spot dozens of different species of plants, birds and other wildlife. With 210 hectares of parkland featuring a 3.3km circuit for waterskiing and other water sports, this facility has a very attractive two hectare bbq and picnic & swimming area, woodlands, natural and artificial wetlands, walking and bird watching trails. Three hour guided bus tours operate on Mondays to Saturdays. 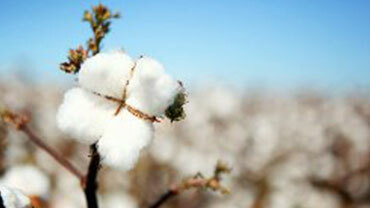 Visit Goondiwindi Cotton, a cotton gin, a cotton farm, citrus orchard, Euraba Paper Company and more. 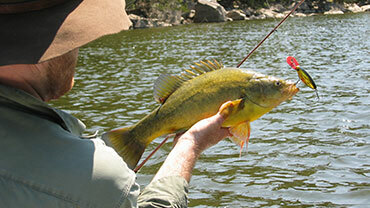 Goondiwindi and district boasts some of the best inland fishing in Australia with catches of Golden Perch (Yellowbelly) and Murray Cod firmly on the agenda. A free Camping and Fishing Guide is available at the Visitor’s Information Centre. Be aware that bag, size and seasonal restrictions on catches apply. 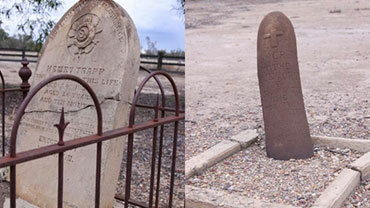 19km west of Goondiwindi on the Barwon Highway, the Callandoon Pioneer Cemetery contains six graves dating from 1876, with only two head stones now standing. Callandoon once had a Post Office, Police Barracks, Gaol and CPS Office. Take a short break from your drive, stretch your legs and feel the history that surrounds you. 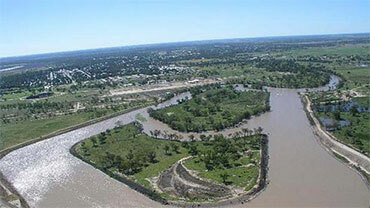 The Euraba Paper Company is Australia’s premier indigenous paper mill. 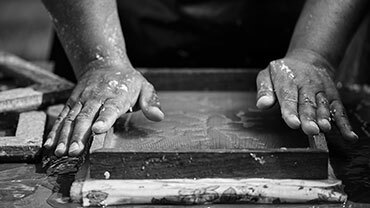 An intiative of the Goomeroi women of Toomelah and Boggabilla, Euraba’s enterprise involves locally and traditionally sourced fibres, handmade into sheets of paper, paper products and artwork. 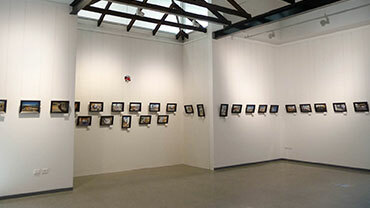 Visit the Euraba Gallery and view work by local Aboriginal artists or purchase a handmade paper products. 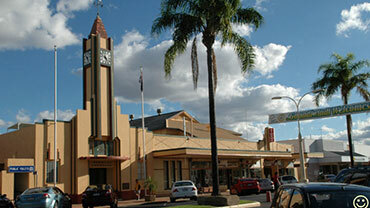 Take a walk along Goondiwindi’s main street and see the last irreplaceable examples of architecture in town from this flamboyant era. 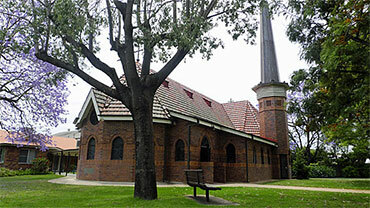 Admire the 24 stained glass windows at this historic church and observe the unique architectural desiging and impressive spire. Visit the Goondiwindi Cotton showroom to see their impressive range of clothing made from cotton grown in the fields surrounding the town.